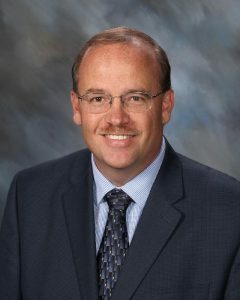 The 2018-2019 school year marks Mr. Johll’s third year as principal. An experienced educational administrator, Mr. Johll has served as assistant principal at Roosevelt since 2005. As principal of Roosevelt, Johll is responsible for the strategic and day-to-day operations of the school, which serves approximately 1,160 students and 145 professional and support staff. Mr. Johll brings energy and creativity that ensures an exceptional learning environment at Roosevelt. Principal Johll’s focus is to assure that all students learn and grow in a safe and welcoming environment. Mr. Johll seeks to provide an educational environment focused on the 21st century learning skills of collaboration, critical thinking, creativity, and digital age literacy. To promote this type of learning, he will work to ensure that Raptor students receive instruction that will include the use of our many computer labs as well as technology tools such as laptops, tablets, and 3-D printing. Mr. Johll can often be found participating in classroom activities and making sure our students follow the Raptor 3 R’s: Respectful, Responsible, and Ready!